This is your Monday morning wake up call. Before you attend that all-important meeting or start making those endless phone calls or tweets, do yourself a big favor - update your LinkedIn Company page now. As we all should know by now, LinkedIn is an incredibly valuable networking and marketing resource for businesses. Hopefully you have taken care of your personal brand with a strong, up-to-date LinkedIn profile. What about your company page? Here's an opportunity to directly attract qualified sales leads from the best known professional social network in the world. Let's get busy with that. If you think you don't have a company page yet, you may be mistaken. When you and your employees sign up for LinkedIn with a common company e-mail address, a company page is created for you. The first person from your company to access your company page is able to start assigning Administrators. Once that happens, only they can update your company page. ***Important*** Make sure that first administrator is someone not likely to leave the company, like an owner. Then, make sure other trusted employees are given administrator access. Why? Because if a single employee is your page administrator, and they subsequently leave the company - you're stuck unless they voluntarily add new administrators and remove themselves. Once you're straightened out company page administration (which is a mess and needs to be straightened out, LinkedIn! ), you should create a marketing strategy for your page that is in line with your overall business development strategy. Your objective is to communicate who you are, what you do and why the reader should be interested in your products and/or services. Just like your website, only now you can be pretty sure that your visitors are business professionals, not spammers or SEO companies looking for business. Complete your profile with all of the pertinent contact information and upload a good quality logo image. Your description is crucial, since this is the first thing people will read about you. Hint: Create an impressive first paragraph, under 297 characters in length, that is essentially your "elevator pitch". LinkedIn truncates your description and places a "more..." link below that to allow visitors to read more of your description. If you haven't hooked them before that, there's little chance they will read more or visit your Products or Services pages. Don't forget to add a contact person and phone number! While you're here, make sure you include your company Twitter ID and Blog RSS Feed - those will keep your company page fresh with your latest blog and social media content. This vital section of your company page is often overlooked. Don't miss this opportunity to promote your core products and services. Click on the Products and Services tab and include a representative image and a short description for each item. Now you're making an elevator pitch for individual products or services. Tell your readers what it is, why it's valuable to them. Address a specific need and how your delivery solves the problem. Next, ask for recommendations. Don't be shy, ask your best customers to go to your Product or Services page and add a brief recommendation for the ones they've purchased. This will go a long way towards convincing new customers, just like customer ratings in Amazon.com. 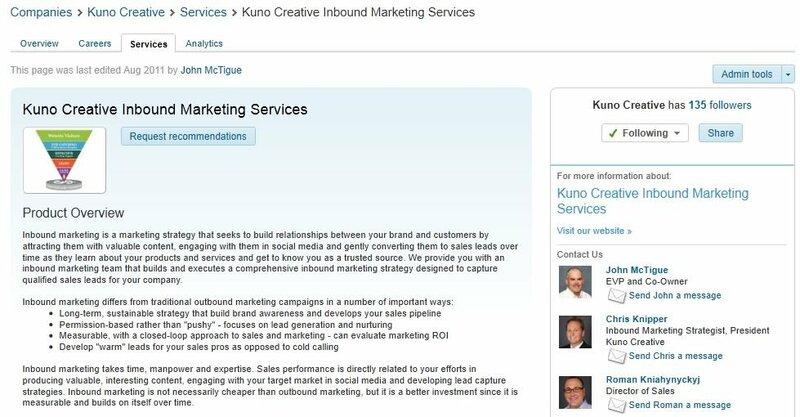 Last but not least, drive qualified leads to your LinkedIn company page. Include a link on your website, blogs, e-mail marketing content, PPC campaigns and LinkedIn ads. I think you'll find that LinkedIn quickly becomes one of your best sources of qualified business leads and customer conversions.